Back row (left to right) James Stanley, Dan Holmes, Dom Hipkiss, Jimmy Abbs, Stephen Jones, Jordan Webb. Front Row (left to right) Sam York, Ronan Thompson, Arrun Bhogal, Matt Bowen, Adam Passmore. 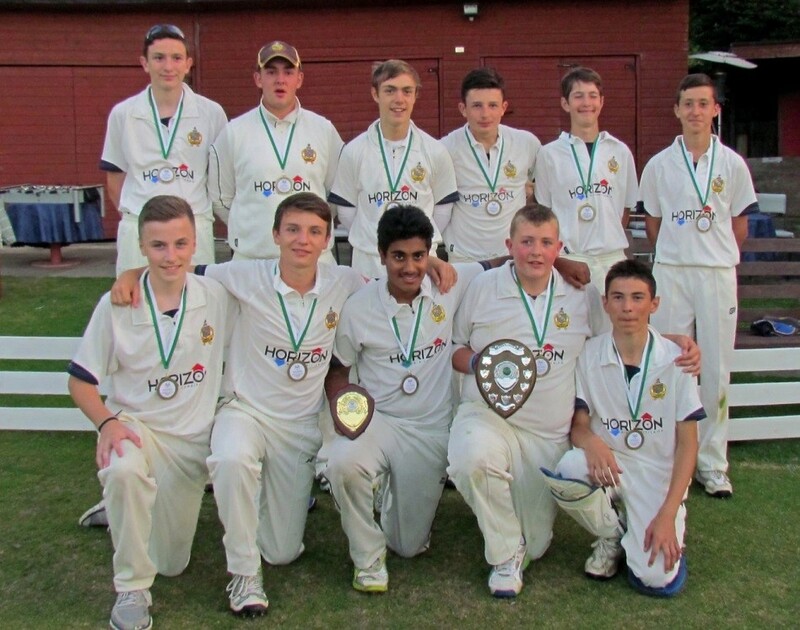 A strong batting display, which included a near-half century for Arrun Bhogal and a quick-fire 23 from Dom Hipkiss late in the innings, saw Himley U15s through to a convincing 72-run victory over Rushwick in the WCB Under 15 league final at Feckenham. Himley reached the final by winning all of their games in the North division and then beating Barnt Green in the semi-final. Rushwick won the toss and asked Himley to bat first. Arrun Bhogal and Matt Bowen batted fluently putting on 55 for the first wicket when Matt was bowled for 23 in the eighth over. This brought Adam Passmore to the crease and the two left handers progressed the score to 102 when Arrun was out for 49 in the 17th over. Stephen Jones sacrificed his wicket in the search for quick runs for five in the 18th over, with the score on 113. This brought Dom Hipkiss to the wicket and his 23 – 20 of them in the last over – saw Himley to 149-3 from their 20 overs. Rushwick lost a wicket in the second over of their reply, W Burgoyne bowled by Jimmy Abbs for four, with the score on seven. This was followed by a wicket for James Stanley in the third over, bowling J Arnold for nought with the score on eight, in the third over. James struck again in his next over, bowling G Francis for five and again in his last over bowling T Davis for two to finish with 3-6 off his four overs. James then followed up with a catch off the bowling of Stephen Jones to dismiss R Stone for 10. Ronan Thompson then bowled M Neal for three to leave Rushwick on 35-6 at the halfway point. Arrun opened his spell with a double wicket maiden, bowling T Ellison for 13 and trapping L Bendall LBW for nought. There were no further wickets, as S Lucas, 11 not out, and C Davis, 7 not out, defied the Himley bowlers, with Rushwick finishing on 77-8. Some of the gloss came off the victory for Adam Passmore, whose helmet was broken by being hit by the ball – which also cost Himley five penalty runs. In conjunction with ECB, Himley Cricket Club will be one of more than 300 hundred cricket clubs all over England and Wales opening their doors to everyone to come and watch the Investec Ashes Series live on Ashes Saturday and Sundays. Himley’s ‘open day’ will be Saturday August 3rd for the third Ashes Test from Old Trafford. As well as keeping one eye on the Test match, you will be able to watch some fantastic live action in the flesh in the form of a kwik cricket match before a mouth-watering fixture, as Himley take on Shrewsbury in a Birmingham Premier League fixture starting at 12pm. Other activities available during the day will be to test your batting skills against the bowling machine or take part in the catching competition against the fielding machine during tea. When not on the bouncy castle, Himley’s award winning junior section will be giving away training session vouchers and you will be able to learn about various membership opportunities with Himley’s senior men’s and ladies teams. If you are not the energetic kind, you can browse a fascinating selection of pictures and mementos of Himley’s 130 year history which is on display in the pavilion. Entry to the ground is free and along with the cricket there is a licenced bar and food available throughout the day. Parking is also available at the ground. Himley CC are pleased to announce the signing of West Indian all-rounder Sergio Fedee in a bid to boost their Birmingham League challenge. ​Himley Cricket Club have discovered a batting prodigy in Chad Brandrick, who helped his team to victory with an unbeaten century on his senior debut - at the age of just 13. 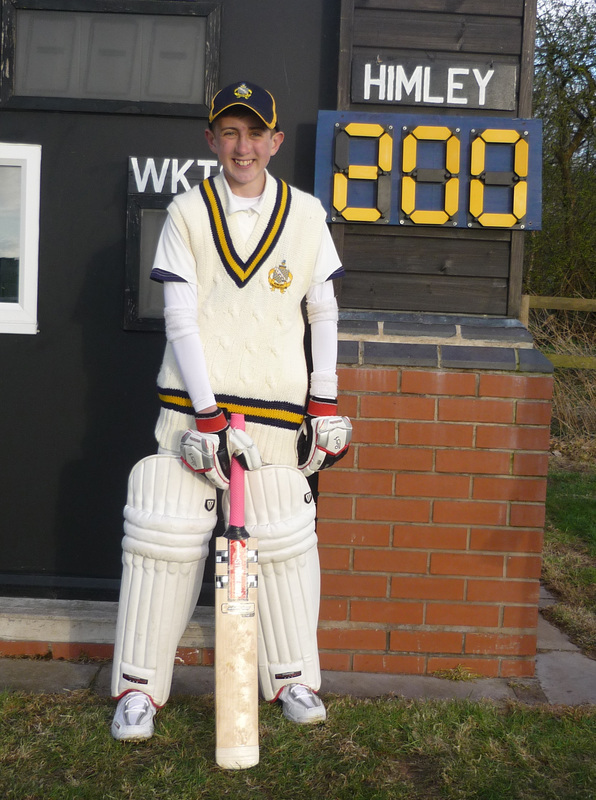 Chad, usually found starring for the club's under 13s, hit 100 not out on debut, in Himley's 227 total against Cannock CC on the way to a 195-run victory in the senior's Staffordshire Club Cricket Championship. Back with the under 13's the following day in the Worcester Premier League, he followed up his senior century with 101 not out against Ombersley, helping his team to a total of 228 and a 34-run victory. ​Himley Cricket Club will host minor counties Shropshire Cricket Club and Staffordshire Cricket Club on Sunday 14th April, at Himley's Stourbridge Road ground. The format for this friendly season opener will be 50 overs per side, starting at 11.00am. Entrance to the game is free of charge and is open to all. ​Summer is on its way and in order to get your club ready for the season we need your help. Players, committee members, members and supporters will be at the ground from 9 am on Saturday 6th April doing many jobs to ensure we hit the ground running for the following weekend. To add to the excitement we have Staffordshire playing Shropshire on Sunday 14th April in a 50 over game so it is imperative our ground, facilities and clubhouse are in tip top condition for this prestigious game. We look forward to seeing you on the 6th together with anyone you want to bring along to help and any donations of materials such as paint, brushes etc will be gratefully received. Please advise if anyone has any specialist skills that we can utilise on the day i.e. builders, painters etc. See you on the 6th April. Himley Cricket Club are running free cricket sessions at The Evolve Building, Dudley College, Tower Street, Dudley, DY1 1AF for girls and boys in years 3, 4, 5 and 6.